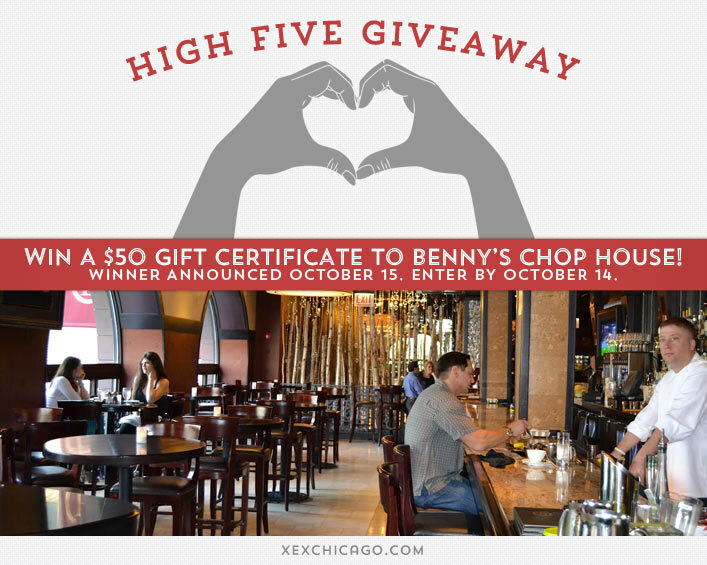 Win a $50 Gift Certificate to Benny’s Chop House! Congratulations to Courtney Hager on winning the $50 gift certificate to Bar Louie in our 104th High Five Giveaway! Our next giveaway is for a $50 gift certificate to Bar Louie! As the unparalleled Signature Cocktails proudly displays “Something Old… Something New” as its title page – this too is the balance that defines Benny’s Chop House, a modern vision of traditional Midwestern dining. The common goal for the entire team of service professionals is the same: to ensure that every guest leaves with the absolute best possible memory of our graciousness, warmth, sincerity and commitment to hospitality. Our culinary team add to this vision: to prepare the absolute best USDA Certified Prime Beef, sustainable seafood, handmade pasta, and the highest quality chops – Pork Chops, Lamb Chops, and Veal Chops. The menu at Benny’s Chop House will tantalize the palate with broad strokes of creativity, dishes rooted in simplicity yet rejuvenated and striking, allowing diners to realize that you are inside a comfortable culinary sanctuary that is so much more than a traditional Chop House. The beverage program at Benny’s competes with some of the most acclaimed fine dining restaurants in the world. The extensive wine list is composed of 1,000+ standard labels and some of the world’s most eclectic selections. The creative cocktail program at Benny’s has been compared to the most cutting edge cocktail lounges and clubs. The beer menu is borderline genius as one is able to pair the many craft selections specifically with appetizers, entrees and desserts. Benny’s Chop House features the artwork of expressionist Matt Lamb, as dozens of stunning paintings adorn the warm mahogany wooden walls. The bar and lounge is enticing, complete with comfortable bar seating, high-tops for dining, and a relaxed lounge area. The nightly entertainment enlivens this setting with energetic and soulful jazz, creating the perfect ambiance at Benny’s Chop House. Benny’s Chop House is located at 444 N Wabash Avenue, Chicago. Visit their website or call them at 312-626-2444 for more information. What Aveda product works great for quickly adding texture and volume to your hair? Hint: Check out our recent blog post for the answer! Now, just add a comment to this post with the right answer to be eligible to win! The winner will be announced on Wednesday, October 15. Entries must be received by midnight on Tuesday, October 14. Good luck! Pure Abundance Hair Potion by Aveda. Aveda’s Pure Abundance Hair Potion- which I love!! Aveda’s Pure Abundance Hair Potion ! Avedas pure abundance hair potion! Aveda Pure Abundance Hair Potion.